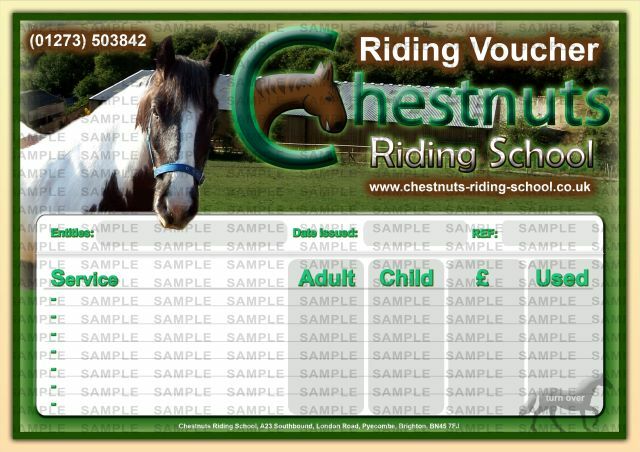 The Chestnuts Riding School sell vouchers all year round, you can buy them from our website or collect them from the premises. 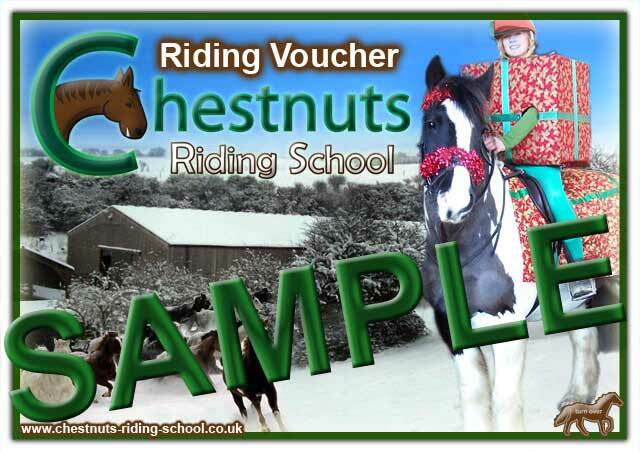 Vouchers start from £13.50 (u16) / £16 (adult) for a Handler Led Horse/Pony Ride. Handler Led Walkouts (they take place outdoors) are weather dependent, and you're basically along for the ride, so they are ideal for small children or corporate adult groups. For an individual, it's probably best to purchase an Introduction/Assessment Lesson and you'll be taught to ride in our Indoor Arena.hese are great for Birthday Presents or Gifts in general. If you wish to purchase additional lessons as well, Private Lessons are the natural way to progress, theres much more information available across the website. This is quite a long page, and we advise you review the sample images and read our Terms and Conditions below. 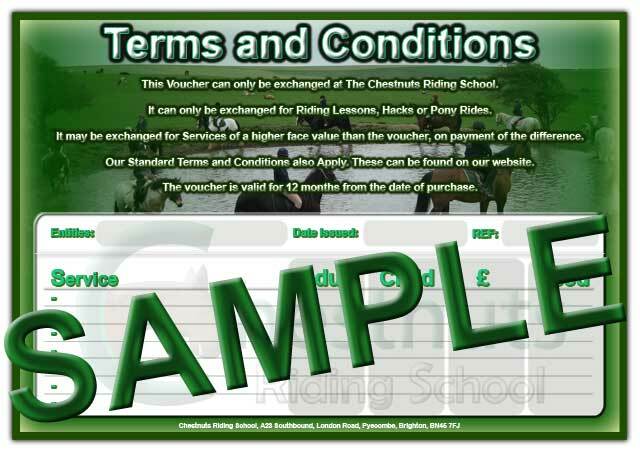 However, we can only sell Introduction/Assessment Lessons, Private Lessons and HANDLER LED Horse/Pony Rides in Voucher Format. It doesn't matter whether the voucher recepient is a rider, we have to put every client through a mandatory Assessment Lesson if they state they can ride, this is done to improve Health and Safety. If the rider is a Beginner or Novice, then they will have to continue taking Private Lessons until they are proficient at Walk, Trot and Canter. Once they've learned the essesntials, then they can join a Group Lesson, learn to Jump or go Hacking. Can you confirm the rider has no Medical conditions that require doctors approval. Explanation of Booking Availability - 23/05/2009 Most of our popular booking spaces are in high demand currently, so we’re reluctant to sell vouchers at this time, but providing you understand the following, then it’s still possible. We do have spaces, but it depends on the day/time, and sometimes it requires joining a waiting list. That said, vouchers receive the highest priority for spaces. As an example it's much harder to get a Introduction / Assessment Lesson on the weekends if you're a beginner (never ridden or walk only) or novice (proficient walk/trot with some canter experience), but there is more availability for intermediate riders (proficient Walk, Trot and Canter) as they are eligible for more services such as Group Lessons, Hacking, Jumping Lessons. If the recipient of the voucher is able to make Off-Peak Slots during the week (0900-1500), then we can generally book you in for an irregular space more quickly, within a couple of weeks on average. Simply, bookings are subject to availability, it's easier to redeem the vouchers in the summer because the Groups often Hack out leaving the Indoor Arena available. Submitted by Anonymous on Thu, 14/01/2016 - 11:38. I am trying to buy gift vouchers on line but your "click here to buy now" ikon doesn't seem to work. Could you advise me what to do? Submitted by admin_chestnuts on Mon, 05/09/2016 - 13:40. We've got Waiting Lists for most times, so no longer selling Vouchers online at the moment. Page will be updated again if this is the case.